We all are born with a soft and beautiful skin, but aging takes its toll on all of us! However, it’s not always aging but also the other factors like hormonal changes, exposure to UV rays, pollution and improper care that cause pigmentation issues. Lasers are the ideal way to correct acne scars, blast away melasma, hyperpigmentation and other common skin concerns. Laser toning treatments can effectively treat stubborn pigmentation issues by giving low energy from the Q Switched laser which leads to decrease in the melanin in the superficial layers of the skin thereby correcting pigment irregularities. Moreover, the laser also helps in stimulating the collagen and elastic whilst rejuvenate the skin texture with little to no down time whether they are at the top of the surface or deep in the dermal layers. This treatment is an ideal solution for the patients with cosmetic concerns like pigment irregularities, age spots, uneven skin tone or blotchy skin, open pores, tanned skin etc. It helps to improve their appearance on the skin and provides instant rejuvenation or “brightness” to the face, neck, and hands. Laser toning promotes sub-dermal collagen production that helps to improve skin texture, color and tone. Q switched lasers utilize the Genesis mode (a quasi long pulse mode) to essentially “heat” the skin and stimulating collagen production which helps in collagen remodelling and also the improvement in the appearance of open pores and fine lines. Further the toning mode (a large spot size and low energy) helps in telling the pigment producing cells or the melanocytes to “calm down” via a process of subcellular selective photothermolysis of the pigment producing cell or the melanocyte (essentially decreasing melanosome/ pigment granule production and its transfer to the skin via the pigment producing cell). This also makes the procedure safe as the pigment producing cell is not completely destroyed its just told to “calm down”. We at Veya Aesthetics use a state of the art Q switched device to provide laser toning. It is a safe, effective and painless treatment though patients may feel a sensation of heat when the laser hand piece hovers over the skin following the procedure. Laser toning is a non-ablative treatment thereby causing no damage to the skin. No bruising or swelling means patients can continue living their life immediately after the treatment. One typically requires 4-6 sessions of toning which can be used not only for the face but other body parts as well. The hair on the face also undergoes a bleaching effect and falls off further providing a brightening effect to the skin, which one looks for. A word of caution ? Laser toning is a procedure which requires sophisticated treatment and high power machines and may cause more damage than good if done by substandard machines, so it is our endeavour to educate and urge our patients to choose the RIGHT place and MACHINE to consider this procedure. If done well this is a procedure which is popular since it has minimal discomfort, no downtime and gives an immediate radiance to the skin. Are you planning to have your first laser toning session? Contact info@drrajatkandhari.com to book a consultation and clarify all your doubts. At Veya Aesthetics we first examine your skin, discuss different treatment options available for you and then suggest the best suitable option depending on your specific skin concerns. 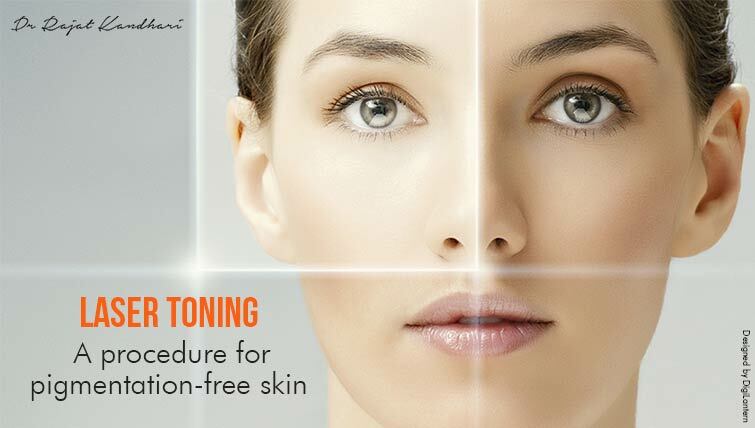 If you wish to experience an amazing transformation of your skin with Laser Toning Treatment, visit us!